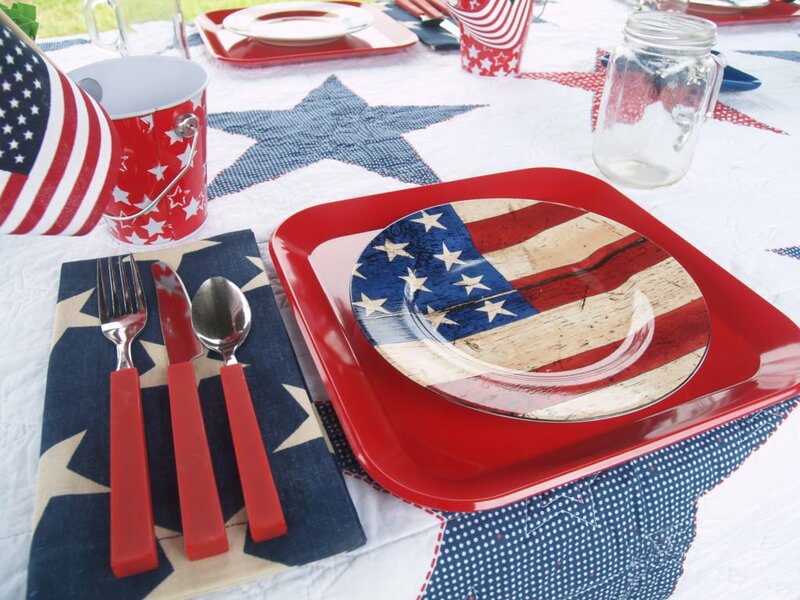 Memorial Day in the U.S. is a popular holiday to have picnics and parties with family and friends to celebrate and remember the men and women who died while serving in the country’s armed forces. This year, whether your hosting or bringing potluck, why not add a little something Greek to the menu? It is easy and fun to prepare Greek finger-food dishes and summer treats! 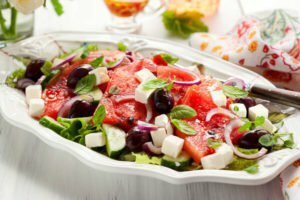 Let’s take a look at some of the Greek dishes that are sure to impress at your Memorial Day party. 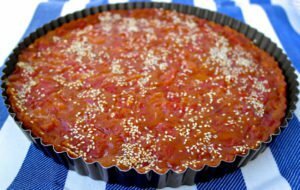 Greek Island Watermelon Cake (from the island of Milos)Whether you are eating this watermelon cake plain or garnished with a dab of Greek-style yogurt, either way, you are sure to enjoy it! This dessert is fairly low-fat, and can use either white or brown sugar, depending on how sweet you would like it to taste. Pites (pies or turnovers) can be eaten at anytime during the day in Greece. You will see people enjoying a cheese pie for breakfast, lunch or dinner as they are quite versatile and filling. 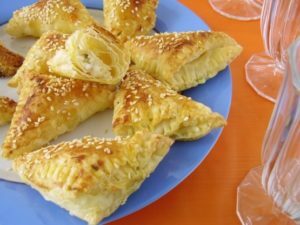 Made with phyllo or a light bread covering depending on what regional style of pita you are eating, these pies can be filled with anything from spinach (to make spanakopita), chicken (resulting in a kotopita), and cheese as mentioned above, or what Greeks call tiropita. Click here for a tiropitakia recipe. 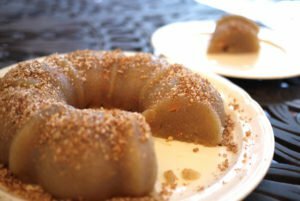 The delicious Greek desert Halva with Semolina “Cake” is sure to go over well with your party-goers and it is really simple to make! This no-bake desert even has an easy to follow video that you can follow along while creating this authentic Greek dish. Keftethakia is a favorite dish and easy to make. You can make large batches of the meat mixture and use some of the meat for the cocktail meatballs, while you can make hamburger patties for the grill with the rest if you’d like. All you need is a few ingredients and toothpicks and you are ready to go. 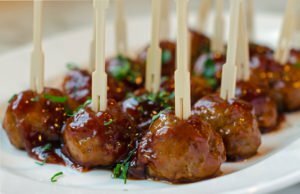 You can even make the meat in advance and cook up everything the day of your party so that they are fresh and be sure to garnish them as you please! A favorite Greek food is stuffed grape leaves, or dolmades. The name of the dish refers to two varieties of Greek dishes that can be made with either cabbage or grapevine leaves. The leaves are stuffed, then rolled into little logs and cooked. 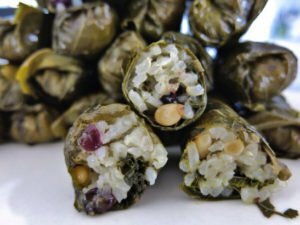 Dolmades made with grapevine leaves are usually suitable for vegetarians since they are typically stuffed with rice and herbs. They are then served at room temperature with lemon wedges and yogurt. Click here for the video on how to make dolmades and the recipe. 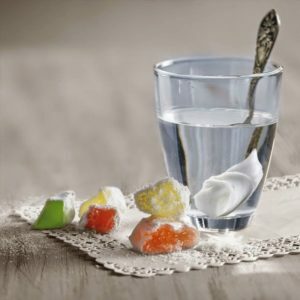 One typical spoon sweet is from the island of Chios called the ‘ipovrichio’ or submarine. It can be flavored with vanilla or as mastic and is made from mastic resin, for which the Aegean island is famous. This sugary fondant is served on a teaspoon and dipped into a glass of ice-cold water, thus why it is referred to as a submarine. Once you get your spoon submerged, the fondant softens and you go to work licking the spoon like a fondant lollipop of sorts. This is a twist on a more traditional Greek salad that you are most likely to come across in a Greek restaurant or while on vacation in Greece. Give it a try and you will be pleasantly surprised!